Submitted by Ancarion on 2019-01-13 18:06. 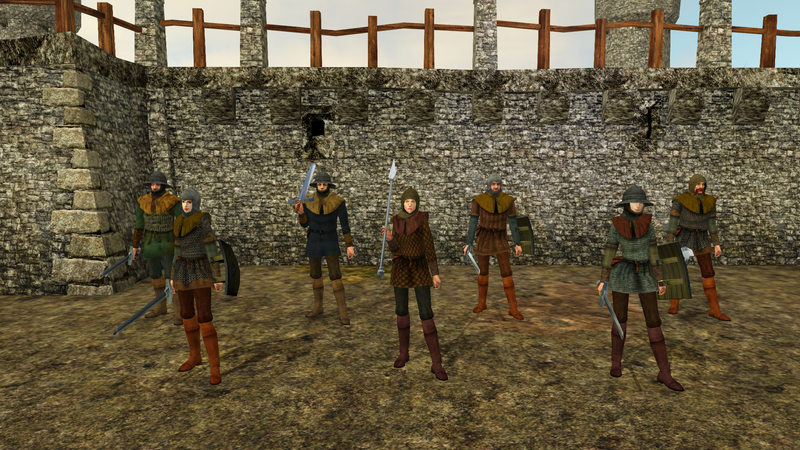 This is a collection of 36 character models, representing typical medieval peasant soldiers. There are six armor types, all with male and female human versions, and each has three face and helmet variants: a kettle helm, a bascinet, and a simple hood. The armor and headgear are mostly adapted from another popular game. 2da lines are supplied as well, which can easily be appended to whatever appearance.2da file you happen to be using in your module. As always, do whatever you wish with this. I make no claims of ownership or ask for any credit if you happen to find a use for it in your own modules, as long as the contents are kept freely available for anyone else to use as well. These are an excellent addition to the NWN multiverse. Thank you for sharing these. Fabulous! So useful. Exactly the authentic look we need. Downloaded and tested, happy enough. 5 stars because I want to see all modules use these humans as guards. This is what historical armour actually looks like! FYI, 'Late Medieval Soldiers' is a better description. The ones in metal armour and/or helms are certainly professionals and not peasant conscripts. Kudos to the original author for creating maille of two different qualities - small diameter rings and large diameter rings. The small rings create a finer mesh and protect much better than the larger rings. Regarding Usage: I recommend equipping the large ring soldiers with AC 3, the small ring soldiers with AC 4, the lamellar soldiers with AC 5, and the soft armour with helm soldier with AC 2. While the figures themselves are not wearing enough body armour to account for those armour classes, once one takes into account their helms, then the equipped armour is a good enough representation. Likewise, if they are only wearing a coth hood, use armour of one less AC (e.g. lamellar & hood use AC 4 instead of AC 5, chain & hood use AC 3 of AC 4, etc.). Beautiful models and universally usable as merchenaries, guards or brigands.